Most of the time when I make a salad, I just chop up lots of greens and veggies that I have on hand, but when I harvest or find small colorful potatoes at the market, I make this Green Salad w/ Artichokes & Baby Potatoes – it’s one of my favorite salads and a pretty impressive dish for entertaining. I especially like to find the Peruvian Purple Potatoes. Peruvian Potates are really purple; there’s been no photo doctoring going on in the picture above. Like all brightly colored vegetables, these potatoes contain plant compounds called phytochemicals. Phytochemicals help the body deal with free radicals, which cause oxidation that can damage cells and tissues in the body. Oxidation damage can lead to health problems like cancer, heart disease, arthritis and cataracts. In addition to disease prevention, phytochemicals help people with diabetes control blood sugars. 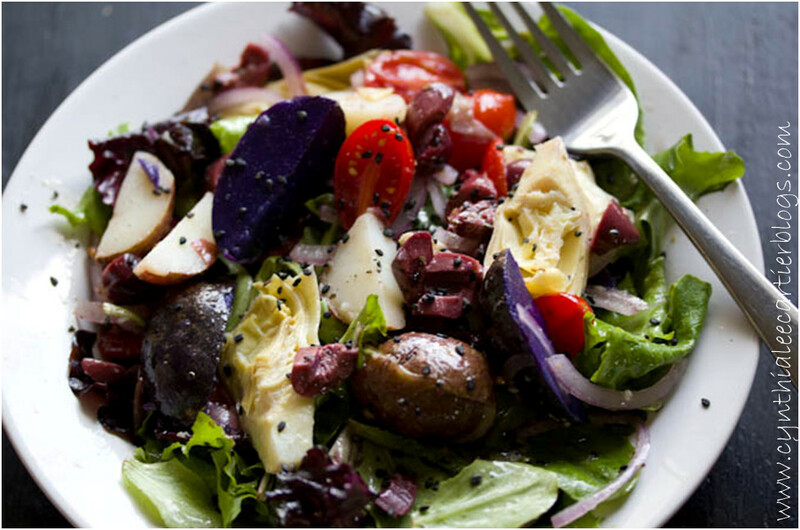 Colorful baby potatoes are becoming more available, but if you can only find small reds or whites, this is still a salad well worth making. Baby potatoes or new potatoes are simply potatoes that have been removed from the soil before they’re fully grown, either to thin out the crop to make room for the other potatoes to mature to full size or because the smaller potato is desired. Place potatoes in a large saucepan and cover with water. Add salt. Bring water to a boil, reduce heat and simmer 20 to 25 minutes, until fork tender – do not overcook. Drain and set aside to cool, then cut into quarters. Toss mixed greens with 1/2 cup of the vinaigrette in a large bowl. Transfer to individual serving plates or a large serving platter. Combine potatoes, onion, cucumber, tomatoes, artichokes, olives and basil in a large bowl. Toss gently with remaining 1/2 cup of vinaigrette. Arrange potato mixture over greens, sprinkle with a little Black Gamasio and serve.